The first practice is silence. I’m keeping silence partially on my own and partially with my fellow seekers in the catechumenate. Last Wednesday, for instance, the other catechumens and I sat in silence for 10 minutes, breathing in and out to an unspoken mantra. As I inhaled, I heard the ancient words Lord Jesus Christ; as I exhaled I heard their equally ancient reply, Have mercy on me. Ten minutes is an almost staggering amount of silence in a culture that doesn’t have a lot of time for quiet – at the first pause in a class or a conversation or a workday we will reflexively turn on our screens, fighting off the silence as though it were a flow of water that we must bail out before it sinks our ships. But somehow on Wednesday we kept the silence together. When the silence ended and we reflected on our shared experience, some of us said that it seemed as though the 10 minutes had taken an hour, while others felt like the time had gone by in something close to an instant. Sitting there together after the silence, it felt a bit like we had woken up as a group from a gentle and beautiful dream, a dream in which we knew that God was with us. My second practice this Lent is working with my hands. Fourteen of us at church decided a few months ago that we each were going to build or draw or paint (or, in the language of iconography, pray) a station of the cross. The stations are slowly appearing on the church’s walls. My station is the very first one in the sequence, ­Pilate condemns Jesus to die, and it exists in three dimensions. It’s a sculpture or a model or, if you like, a miniature theatrical set. There was something unexpected and beautiful in crafting the shape of Jesus’ body with my hands. There is something awesome, now, in looking across the room at a prayer that I built. Finally – and perhaps this is a more traditional practice – I have given up or, I suppose, taken a break from a couple of things this Lent. For several years running I have signed off of social media come Ash Wednesday. And last year, I added the element of abstaining from booze. Now, I mostly like social media – through it I have discovered artists and thinkers and theologians whom I would’ve never otherwise met, and I am grateful to have updates on the lives of distant classmates and colleagues. And I really like drinking wine with friends. But I wanted to take a break from both, lest they become habits that I lapse into uncritically rather than joys that I choose. I think I’ve told you before that a Lent without Facebook’s big white wall feels less like a sacrifice and more like a kind of detox. But I haven’t shared before what it’s like to be, at least for a season, someone who doesn’t drink. This final practice has been an invitation into empathy with all of my friends in recovery, an invitation to discover what it’s like not to drink in a culture in which drinking is assumed. So. Three prayer practices. All of which are teaching me about community, about God, about myself. I’m someone who spends a lot of time in my head and in the realm of words. And each of these practices is reminding me of the world beyond language. Silence is reminding me that God, as Elijah knew, sometimes shows up when the noise stops, that God often prefers to whisper rather that to shout. 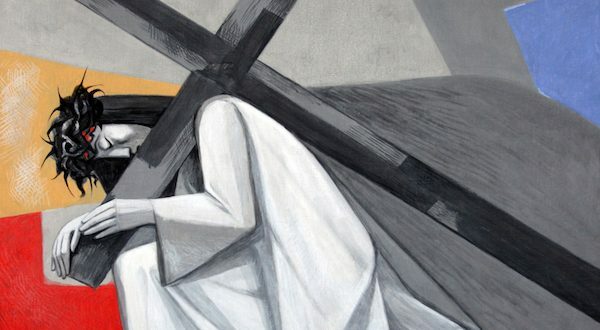 Crafting a station of the cross is reminding me that Teresa of Avila was right, and that our hands are indeed Christ’s hands in this hurting world. And abstinence is reminding me to look beyond my own experience and see that Christ, now and always, is the one whom we meet in our neighbor.